A small selection of photos and feedback from paddlers who have bought their paddles at Kajakkspesialisten. "Hello Anders, Thank you for the paddle which is a work of art; initially I thought that perhaps I should keep it on the wall rather than use it. However, I've used the paddle 4 or 5 times so far, in the pool first with a short boat, then on the sea in a plastic Valley Avocet and the paddle lives in the car so I don't forget it! I thought you might like to see some pictures of it being used, thanks to Tom Turner of the Jersey Canoe Club who took these on Valentines day off our South West coast. 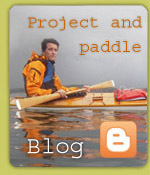 I've had lots of interest from other paddlers - the three who have tried it have liked it. All have commented on how light and well balanced it is. I love the feel of the paddle and a close inspection shows a complex shape to the blades which must take a lot of skill to produce. I rolled with it on my second attempt in the pool, and think it is probably easier to roll with than with the Euro paddles I'd been using. On the sea I've been able to keep up my usual pace without a problem; I had been worried about being left behind with such a slim blade but it has plenty of purchase on the water. I'm working on the support strokes so haven't tried it in really rough water yet but I am more and more confident that it will become my everyday paddle." 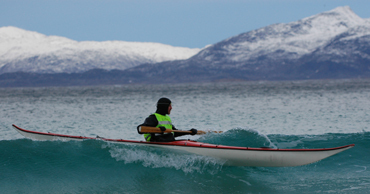 Karl Annar Markussen, Harstad bought his fist Greenland paddles here in 1999. 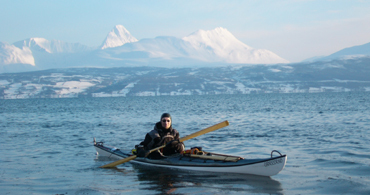 Frank Eriksen from Harstad has the same good experience with his paddle purchases. The paddle has been thoroughly put to use. The first bout was more than exciting. There were high winds and waves. Perfect for a Greenland paddle, in a way, but not necessarily the best conditions for trying out new gear.To start with, several of my strokes slipped a bit and my lower back got stiff. But after giving myself a good talking-to, turning into the wind and waves and accelerating a bit, the good times rolled. Eventually I was playing like a child in the waves: practising turning techniques, support strokes and almost everything except the roll. (Alone.) I smiled from ear to ear while doing this. It's not a product you're creating, Anders, it's pure joy. The next Wednesday I brought the paddle as a spare for racing games. It didn't go unnoticed. The professionals asked at once if Thygesen had made it. Then it was sent around for everyone to examing, with corresponding remarks about shape, weight, looks, reinforcement , use of wood, etc. There are lots of good times associated with paddling. Not all of them have to be at sea...!